Welcome to the Hilda United Methodist Church! Just because we’re a small church doesn’t mean we’re not a vital, mission-oriented congregation! We provide a nurturing, caring Christian environment that supports our members and community spiritually through worship, prayer, evangelism and outreach. The Hilda Methodist Church has been here for 154 years and we’re still going strong! We have energetic members who carry the message of living a Christian life by the way in which they live and care about each and every member. Not only do we take care of “our own”, we have a vital mission program that includes not only our own community and county, but world-wide mission projects. We provide scholarships to youth who wish to attend church camps, but find the cost is prohibitive. We support the Mason Food Bank, the Mason County Annual Cancer Benefit, the Mason County Habitat for Humanity, Steady Steps, and many other local and county projects. We have two active United Methodist Women’s groups that meet monthly, one in the morning and one in the evening. We also have an adult choir as well as a children’s bell choir. We offer an adult Sunday school class on Sunday mornings beginning at 10:00 a.m. with contemporary studies that use the Bible as our guide. Our youth are involved in our morning worship services and also in many of the youth programs in Mason (such as the Youth Lock-In and summer vacation Bible school). Our goals are not only to provide an atmosphere filled with prayer and the presence of the Holy Spirit, but an atmosphere of loving, friendly people who care deeply for one another’s well being. The Hilda Church is place for Christian interaction and we enjoy being together. The church is our extended family and we are committed to spreading God’s message of love and forgiveness. We are committed to maintaining our church, the grounds, and other campus buildings and plan facility development for growth. Long-range goals include the expansion of our music program and updating our methods to effectively communicate to our members and the community the mission, activities, and concerns of the Hilda United Methodist Church. 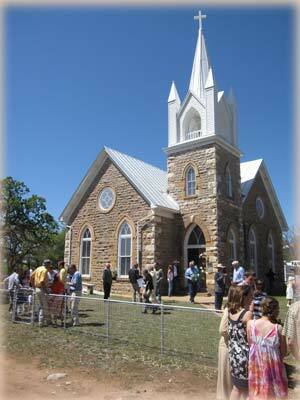 We invite any and all to come visit the “little brown church in the wildwood”! ©2010-2019 Hilda United Methodist Church. All rights reserved.